Panorama of Milford Sound looking northwest from the township. Mitre Peak (centre) rises 1,692 m (5,551 ft) above the sound. Milford Sound is named after Milford Haven in Wales, while the Cleddau River which flows into the sound is also named for its Welsh namesake. The Māori named the sound Piopiotahi after the thrush-like piopio bird, now extinct. Piopiotahi means "a single piopio", harking back to the legend of Māui trying to win immortality for mankind—when Maui died in the attempt, a piopio was said to have flown here in mourning. As a fiord, Milford Sound was formed by a process of glaciation over millions of years. With a mean annual rainfall of 6,412 mm (252 in) each year, a high level even for the West Coast, Milford Sound is known as the wettest inhabited place in New Zealand and one of the wettest in the world. Rainfall can reach 250 mm (10 in) during a span of 24 hours. The rainfall creates dozens of temporary waterfalls (as well as a number of major, more permanent ones) cascading down the cliff faces, some reaching a thousand metres in length. Smaller falls from such heights may never reach the bottom of the sound, drifting away in the wind. Bottlenose dolphins swim under rainbow. Seals, penguins, and southernmost population of bottlenose dolphins frequent the waters, and whales especially humpback whales and southern right whales are increasingly observed due to recoveries of each species. The sound has been identified as an Important Bird Area by BirdLife International because it is a breeding site for Fiordland penguins. The 151-metre (495 ft) Stirling Falls were named after Frederick Stirling, Captain of HMS Clio. Milford Sound was initially overlooked by European explorers, because its narrow entry did not appear to lead into such large interior bays. Sailing ship captains such as James Cook, who bypassed Milford Sound on his journeys for just this reason, also feared venturing too close to the steep mountainsides, afraid that wind conditions would prevent escape. The fiord was a playground for local Maori who had acquired a large amount of local marine knowledge including tidal patterns and fish feeding patterns over generations prior to European arrival. The fiord remained undiscovered by Europeans until Captain John Grono discovered it c.1812 and named it Milford Haven after his homeland in Wales. Captain John Lort Stokes later renamed Milford Haven as Milford Sound. Following the passage of the Ngai Tahu Claims Settlement Act 1998, the name of the fiord was officially altered to Milford Sound / Piopiotahi. 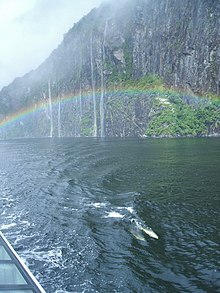 Milford Sound attracts between 550,000 and 1 million visitors per year. This makes the sound one of New Zealand's most-visited tourist spots even with its remote location and long journey times from the nearest population centres. Many tourists take one of the boat tours which usually last one to two hours. They are offered by several companies, departing from the Milford Sound Visitors' Centre. Tramping, canoeing, and some other water sports are possible. A small number of companies also provide overnight boat trips. There is otherwise only limited accommodation at the sound, and only a very small percentage of tourists stay more than the day. Tourists usually stay in Te Anau or Queenstown. The Milford Discovery Centre & Underwater Observatory is located in Harrisons Cove on the north side of the fiord. Situated within the Piopiotahi Marine Reserve, the underwater observatory allows visitors to view the fiord's unique marine environment at a depth of 10 metres. Due to a natural phenomenon called 'deep water emergence,' deep-water animals such as black coral can be viewed in the shallow waters surrounding the observatory. A dark surface layer of fresh water, stained brown by tannins from the surrounding forest, along with cold water temperatures allow the black corals to grow close to the surface throughout Milford Sound and Fiordland. Milford Sound is also a destination for cruise ships. By road, Milford Sound is 291 km (181 mi) from Queenstown and 278 km (173 mi) from Invercargill (about four hours' drive), with most of the tour buses to the sound departing from Queenstown. Some tourists also arrive from the smaller tourism centre of Te Anau, 121 km (75 mi) away. There are also scenic flights by light aircraft and helicopter tours to and from Milford Sound Airport. The drive to Milford Sound itself passes through unspoiled mountain landscapes before entering the 1.2 km (0.75 mi) Homer Tunnel which emerges into rain-forest-carpeted canyons that descend to the sound. The winding mountain road, while of high standards, is very prone to avalanches and closures during the winter half of the year. The long distance to the sound means that tourist operators from Queenstown all depart very early in the day, arriving back only late in the evening. This ensures that most tourists visit Milford Sound within a few hours around midday, leading to some congestion on the roads and at the tourist facilities during the main season. The peak-time demand is also the reason for the large number of tour boats active in the sound at much the same time. Over the years, various options of shortening the distance to Milford Sound from Queenstown have been mooted, including a gondola route, a new tunnel from Queenstown, or a monorail from near Lake Wakatipu to Te Anau Downs. All would reduce the current round-trip duration (which has to travel via Te Anau), thus allowing tourism to be spread out over more of the day. While a gondola is considered to be out of the running after the DOC declined approval for environmental reasons, the tunnel and the monorail proposals have applied to the Department of Conservation for concessions for land access. There are a variety of plane charter companies that fly to Milford Sound. Most of the companies fly out of Queenstown International Airport. These companies include: True South Flights, Glenorchy Air, Air Milford, and Milford Sound Scenic Flights. On 8 February 2004 a spill of 13,000 litres of diesel fuel was discovered, resulting in a 2-kilometre spill which closed the fiord for two days while intensive cleanup activities were completed. Apparently a hose was used to displace the fuel from the tanks of one of the tour vessels, and various government officials claimed it appeared to be an act of ecoterrorism motivated by rising numbers of tourists to the park, though more details did not become known. The spill was removed and wildlife impact appears minimal. ^ a b "Real Journeys rapt with Kiwi Must-Do's", Scoop, 13 February 2007. ^ "Milford Sound, South Island, New Zealand" Archived 19 June 2006 at the Wayback Machine. From the National Geographic Photo Galleries. Accessed 20 October 2007. ^ "New Zealand National Climate Summary–The year 2004" (PDF). National Institute of Water and Atmospheric Research. Retrieved 15 November 2011. ^ "CliFlo - National Climate Database". NIWA. Retrieved 13 December 2015. ^ "A whale watcher's dream". odt.co.nz. 13 November 2015. ^ "The Humpback Whale Migration - Fiordland Marine Guardians". www.fmg.org.nz. ^ BirdLife International. (2012). Important Bird Areas factsheet: Milford Sound. Downloaded from http://www.birdlife.org on 2012-02-18. 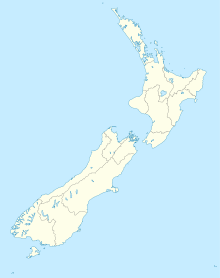 ^ "Stirling Falls, Southland – NZ Topo Map". NZ Topo Map. Land Information New Zealand. Retrieved 4 September 2017. ^ Terry Hearn. Welsh - Milford Sound, Te Ara: The Encyclopedia of New Zealand, Ministry of Culture and Heritage. Updated 4 March 2009. Accessed 2010-02-03. ^ a b Cook, Marjorie (20 February 2010). "Highway through heritage". New Zealand Herald. Retrieved 24 February 2010. ^ Erika Delemarre, Milford Discovery Centre nature guide, tour presentation material 2014-2015. ^ Paddy Ryan. "Fiords - Underwater rock walls and basins", Te Ara: The Encyclopedia of New Zealand. Updated 21 September 2007. Accessed 18 April 2008. ^ "Driving Times". Real Journeys. Retrieved 5 February 2018. 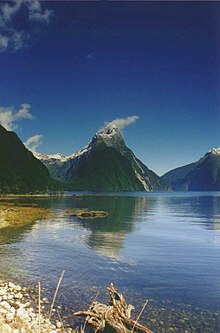 Wikivoyage has a travel guide for Milford Sound. 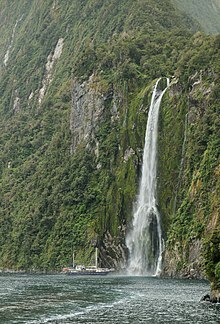 Wikimedia Commons has media related to Milford Sound.